A pair of sleek Rondeau Inaltera prototypes competing in the 1977 Rolex 24 At Daytona captured the attention of IMSA President John Bishop. He felt a GT Prototype class comprised of similar cars would interest American sports car fans. While the venerable and bullet-proof Porsche 935 continued to dominate the Rolex 24 and Twelve Hours of Sebring in the early 1980s, the first GT Prototypes began to hold their own in shorter events on the IMSA GT schedule. The first successful GTPs were the Lola T600, driven to the 1981 championship by Brian Redman, and the March 83G – including the Red Lobster-sponsored car driven by Kenper Miller and David Cowart with a paint scheme that included a pair of giant lobster claws. Bob Tullius and Group 44 offered the Jaguar XJR-5. The 1983 Rolex 24 included a pair of Aston Martin Nimrods, including a Pepsi Challenger driven by A.J. Foyt and Darrell Waltrip. When that car broke early in the event, Foyt was pressed into service to drive Preston Henn's Porsche 935 – despite the objections of lead driver Bob Wollek. That car went on to win, giving the 935 its sixth straight triumph at Daytona. For 1984, Porsche introduced the 962 at Daytona. This car was a variation of the 956 that enjoyed success in Europe, with the front axle moved forward ahead of the driver's legs per IMSA regulations. Mario Andretti captured the pole at Daytona and, joined by his son Michael, had a strong early run in the event before the new car was sidelined by overheating issues. The race was won by the South African Kreepy Krauly team in a Porsche-powered March. One month later, Colombian Mauricio DeNarvaez won at Sebring in a privateer 935. That was the last hurrah for the model. While March won its share of races and the GTP driver championship for Blue Thunder's Randy Lanier, Holbert and Bell broke through with the first victory for the 962 at Mid-Ohio and won five of the final eight races. After finishing second in the 1984 Rolex 24 with a reunited Foyt and Wollek in his 935, Henn purchased his own 962 for the 1985 event. Foyt and Wollek drove to victory in Henn's Swap Shop entry as 962s swept the top four positions. It was a unique race of father vs. son, with the elder Al Unser winning over his son Al Jr., who joined Al Holbert and Derek Bell in the Lowenbrau Special Porsche 962. Foyt and Wollek backed up the 1985 victory by winning at Sebring, with Holbert, Bell and Unser Jr. second in a podium sweep for the 962. Holbert, Bell and the younger Unser returned to win back-to-back Daytona classics in 1986 and 1987, with 962s taking the top three places overall in both races. 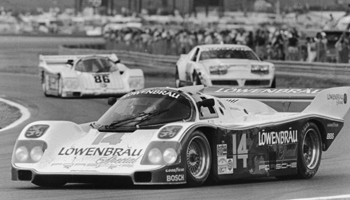 The 962s also won the Twelve Hours of Sebring from 1986 through 1988, with Bob Akin's Coca-Cola-sponsored entry winning in 1986 while Bruce Levin's Bayside Disposal car won the following two years. While the 962 was the car to beat, it wasn't for lack of competition. NASCAR car owner Rick Hendrick fielded a Corvette GTP that won the pole for the 1986 Rolex 24 with Sarel van der Merwe at the wheel. Don Devendort fielded a Nissan GTP that slowly developed into a top contender. Jaguar pulled its support from the popular Tullius Group 44 entries in favor of European Tom Walkinshaw's TWR, with the Tony Dowe-prepared cars quickly challenging for victories. After enjoying success in the production-based GTU and GTO divisions, All American Racers' Dan Gurney entered the GTP wars with a Toyota factory-supported Eagle. BMW and Ford also fielded factory-backed Prototypes. At one point, nine factory teams from nine manufacturers participated at the same time in GTP – Porsche, Jaguar, Nissan, Toyota, BMW, Chevrolet, Buick, Pontiac and Ford – the first and only time that many automakers competed simultaneously. The result: the "Glory Years" of GTP, five seasons of some of the best endurance sports car racing ever seen. The TWR Jaguars won the Rolex 24 in 1988 and 1990, while Wollek was part of the winning lineup as Porsche 962s won in 1989 and 1991. Nissan broke through with its first of three consecutive triumphs at Sebring in 1989, including brothers Geoff and David Brabham joined by Derek Daly in the latter victory. A factory-fielded Nissan R91CP won at Daytona in 1992 – beating the leading IMSA entry, the TWR Jaguar with a lineup including Scott Pruett. Toyota won at Sebring in 1992, with Juan Fangio II and Andy Wallace in an Eagle Mk III. The landscape changed suddenly in 1993. With Nissan and Jaguar both pulling their support – and many of the privateer Porsche teams having fallen by the wayside – Gurney's Eagles were virtually unopposed in the GTP ranks. The Toyotas opened up 1993 with back-to-back triumphs at Daytona and Sebring. The team won every race it entered – it sat out the Road America round with the championship well in hand – and then also called it quits at the end of the year. There was stiff competition in both the GTO and GTU ranks throughout the Eighties. In GTO – production-based cars powered by engines three liters and over – Jack Roush began a streak in 1985 that saw the former drag racer win the Rolex 24 10 consecutive times over an 11-year span in Fords and Mercuries. Roush also won the GTO class at Sebring four times from 1985 through 1990, including a victory for Pruett and Olympian Bruce Jenner in 1986. Terry Labonte prepped for his 1984 NASCAR Sprint Cup Series championship by doubling at both Daytona and Sebring, co-driving with NASCAR car owner Billy Hagan and Gene Felton. The GTU class for smaller-displacement production cars saw a changing of the guard during the decade. With the class once dominated by the Porsche 911, the Wankel rotary-powered Mazda RX7 scored a breakthrough victory at Daytona in 1979, Mazda next won the Rolex 24 in 1982, beginning a streak that lasted until Porsche won in 1994. At Sebring, Mazda RX7 won the class at Sebring every year from 1980 through 1988 with the exception of a Porsche victory in 1985. Yojira Terada, who was part of the Rolex 24-winning lineup for the Mazda factory in 1979 and 1982, returned for Mazda's first race in the GX class in 2013. With the disappearance of the factory-backed GTP Prototypes, it was time for a change in sports car racing's top class – with the result the open-cockpit World Sports Car.